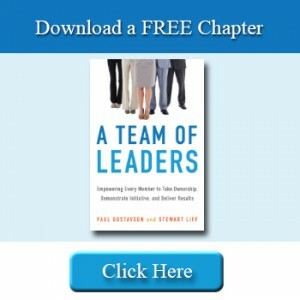 Stew Liff and I are pleased to announce that our new book, A Team of Leaders: Empowering Every Member to Take Ownership, Demonstrate Initiative, and Deliver Results, (AMACOM Books, March 26, 2014), was just named one of the 30 best business books of 2014 by Soundview Executive Book Summaries. Below is some information on that book and its approach. In SHRM’s 2012 Employee Satisfaction and Engagement Survey, only half of the employees reported that they were truly engaged at work. What a waste of available resources! At the same time, ASTD has found that U.S. organizations devoted over $156,000,000,000 to learning and development in 2011, with the largest amount being spent on supervisory development. These statistics are of great concern and lead us to what we feel is the true cause: the way work is designed. In other words, as long as work is structured so that the supervisor is the boss and everyone else is a follower, many employees will feel disengages and disconnected, while supervisors will feel overwhelmed. More importantly, group and individual performance will suffer. Why? Because in the above design, the supervisor has to almost be Superman. That he has to deliver top-notch performance, make all of the important decisions, work with all of the employees, deal with challenging people, perhaps interact with unions, etc. Meanwhile, the employees have to do what they are told, often feel like Charlie Chaplin on the assembly line in the movie “Modern Times,” and have little authority, autonomy or the opportunity to be creative. As a result, half feel disengaged and many feel dissatisfied. We subscribe to the old saying that, “Organizations are perfectly designed to get the results that they get.” We also believe the above design has played a large role in producing the results we just described. At the same time, there is a corollary to the saying which is, “If you want to change your results, you need to change your design.” That is exactly what we are proposing. In short, if you want to have your employees involved, engaged and well developed, while enabling the supervisor to be freed up to focus on other, higher-level work, you should create a team of leaders. Such an approach has been used in many industries with a great deal of success at all levels. That is because such a design successfully counters the design flaws inherent in the traditional structure. That is because there is no longer one superhuman boss who oversees a bunch of subordinates. Instead, everyone becomes as a leader and is involved in all phases of the operation including setting goals, planning, implementation, employee development, scheduling and even dealing with problem team members. The former supervisor moves on to become an advisor to the team and spends most of her time in other areas. To successfully transition from a traditional structure to a team of leaders is not easy, as it requires a lot of time, energy, planning, commitment and upper level support. However, if done successfully, it is well worthwhile. Listed below are the key elements of a successful redesign and implementation effort. Note that every element must fit together so there is balance and focus. You get what you design for – to create the right design, you must first analyze your environment, processes and culture. A Value Creation Model – Team members must understand the value they contribute to the team. Knowledge Management – This is the team’s competitive advantage and must be carefully managed. Visual Management – The team’s physical plant should be redesigned to reinforce every other design element that has been put in place. Teams do not quickly evolve from a Stage One to a Stage Five team. They transition through several stages that require a great deal of nurturing and support. Below is a depiction of the changing roles within the team as it evolves. The red dot represents the role of the supervisor, the blue dot is the team members and the green dot shows the team members as they take on leadership responsibilities. This is how the team evolves, but it doesn’t happen in a vacuum. It happens by designing, aligning and integrating the other five elements discusses above. 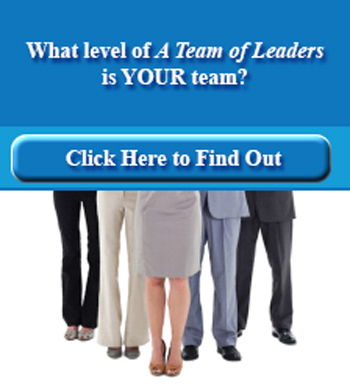 Future blogs will discuss how each element works, relates to each other and helps produce a team of leaders.